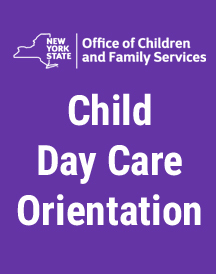 The first step in opening a home child care business is completing the Child Day Care Orientation on the Office of Children & Family Services’ website. You must complete this orientation in order to request an application for a registration/license. It may take a few weeks to receive your application booklet in the mail. Once your application arrives, remember Child Care Solutions is here to help, free of charge! Our Registrars are available to answer your questions over the phone at (315) 446-1220 or in person at our office. Click here for Child Day Care Orientation.